The buckle is finished with more of whichever fruit for which it is named. Feel free to make this recipe using blueberries, raspberries, or any berries of your choice. For a more rustic presentation, this dish is spectacular when served in a cast iron skillet. Spray a 9-inch springform pan with baking spray. In a medium bowl, combine the flour, baking powder, salt, and cardamom. In the bowl of a stand mixer, cream the butter until it is a pale yellow. Add the sugar and continue beating until thoroughly mixed. Add the egg and vanilla. Add flour mixture, alternating with the milk, until well-mixed. 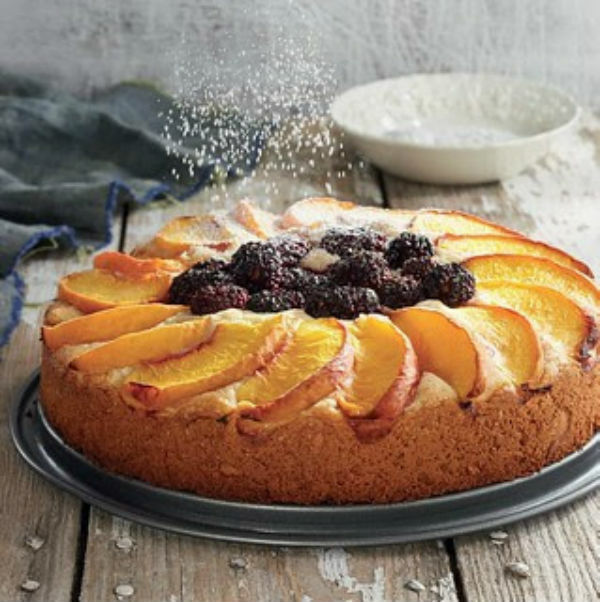 Pour the batter into the prepared pan and add the peaches and blackberries, spreading evenly in a pretty design. Bake for 1 hour, or until golden brown and a cake tester inserted into the center comes out clean. Let cool completely in pan. Remove sides and dust with confectioners’ sugar.